Our Bible reading last Sunday was Luke 23: 13-43. This passage is the crucifixion of Jesus. We were focusing on Simon of Cyrene, who is seized from the crowd and made to carry the cross for Jesus. I started the class by asking one of the students to write the name of our church 1,000 times on the white board. She obediently got up to write, and within a minute another child in the class said, "That's not fair. I'm not doing anything and she's doing all the work!" Simon was an unwilling participant who had a tremendous burden placed on his shoulders. 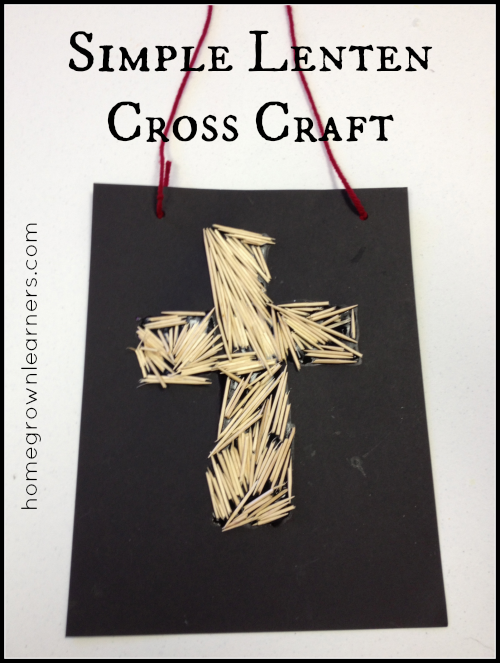 The craft suggested in our Sunday School curriculum was so simple and powerful. The kids all enjoyed it, and I wanted to share it with you. It's perfect for a homeschool activity. 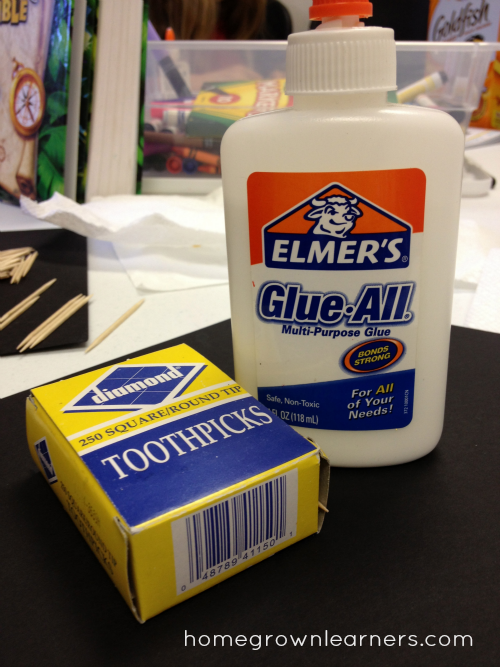 The supplies are simple: White glue, toothpicks, cardstock, and a pencil. If you want to hang it when you are finished you can also get a hole punch and some yarn. Draw an outline of a cross on the paper - make it large enough so you will be able to fill it in with glue and toothpicks. 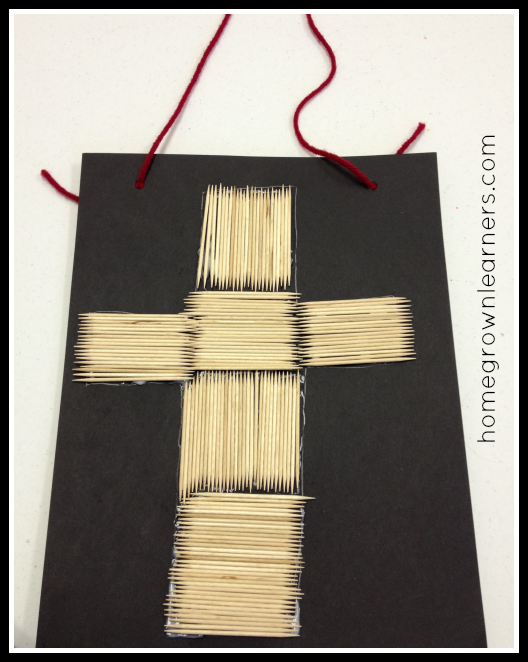 One of the children in our class chose to fill the cross in quite symmetrically, using whole toothpicks. Another child chose to break the toothpicks for a more rugged look. It was fun to see their personalities reflected in their art. Either way, they turn out beautifully. Let the creation dry flat, punch holes in the top, and add some yarn for hanging. This will be a reminder throughout Lent of Jesus' death on the cross. We're also starting each morning with our Lenten readings. Each of the children got an age appropriate booklet at our church. For Grant, there is a sweet devotion each day and then a call to action (a box to money in). For example: contribute $.20 per person at the table and add $.20 for hungry people throughout the world. We find ourselves dropping money in the box throughout the day and we will take it for the offering plate each Sunday. Having this time in the morning helps us focus on Christ and the ultimate price he paid for our sins. It's a time for reflection, quiet, and thinking about what WE can do to help others. Do you have anything special you are doing during these 40 days before Easter? Visit Notebooking Pages - our favorite resource for notebooking!